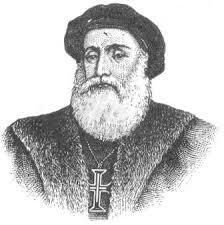 Vasco da Gama Biography: He was born in the 15th century although there is a lot of doubt about his year of birth. As per some recollections, he is said to have been born in the year 1460 while according to some, in the year 1469. However, there is no confusion about the place of his birth which was in the province of Sines. 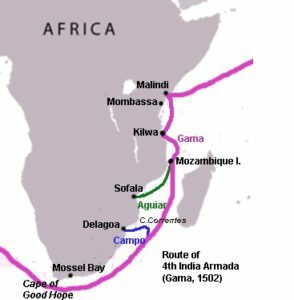 Little is known of the early life of Vasco da Gama; his father was governor of Sines, Portugal, where Vasco was born. He first comes to historical notice in 1492, when he seized French ships in Portuguese ports as a reprisal for piratical raids. He had six sons and one daughter. His second son became governor of Portuguese India. Vasco and his companions set out with four ships July 8, 1497. In spite of storms and tempests, May 20th of the following year they reached Calicut, India, and set up a marble pillar in evidence of their arrival in the country. 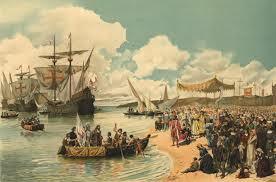 Da Gama’s first voyage deserves to be compared with Columbus’s more celebrated “discovery” of the New World. Neither man actually “discovered” unoccupied territories; rather, both linked anciently settled and developed parts of the world with Europe. He was fittingly honored with many tributes and the title of count of Vidigueria. In 1524 he was sent back to India as viceroy, but he died soon after his arrival. 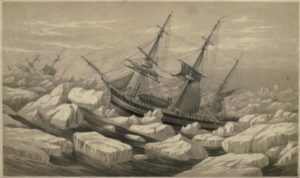 Gama’s voyage is the subject of Camoens’s epic The Lusiads. 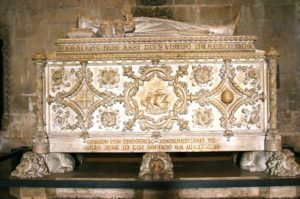 He was harsh in his methods and was not as good an administrator as many of the Portuguese captains who later went to the East, but he was the first, and he was fittingly honored with many tributes and the title of count of Vidigueria. In 1524 he was sent back to India as viceroy, but he died soon after his arrival. Gama’s voyage is the subject of Camoens’s epic The Lusiads. It took four days for the ship to sink, killing all men, women, and children. When da Gama arrived in Calicut on October 30, 1502, the Zamorin was willing to sign a treaty. Da Gama told him that he would have to banish all of the Muslims. To demonstrate his power, da Gama hung 38 fishermen; cut off their heads, feet, and hands; and floated the dismembered corpses onto the shore. Later da Gama bombarded the city with guns and forced his way into the trading system. This led the way for other Portuguese conquests in the East Indies. Originally Vasco’s father, Estevao, was going to be given the command of the exploration fleet, but the trip was delayed for many years. Eventually, the command was given to his son Vasc- instead. There is a crater named Vasco da Gama on the Moon. His fleet on the second voyage consisted of 20 armed ships.